The US-50 freeway from the District of Columbia to Annapolis was opened around 1957, and it is named John Hanson Highway. It had two lanes in each direction. East of the US-301 interchange near Bowie, US-50 overlaps with US-301. Around 1975, the need became apparent for widening and interchange improvements.  Interstate money (90% federal funding as part of the national Interstate highway system) became available when several planned Interstate segments were deleted in Baltimore, in the early-1980s. The segment of US-50 from I-495 to Annapolis was approved for Interstate construction as I-68. 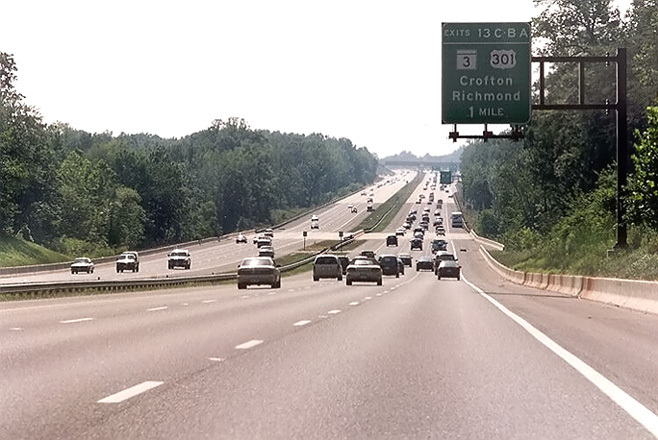 US-50 from I-495/I-95 to MD-70 was reconstructed to six-lane Interstate standards from 1990 to 1995. All the interchanges were reconstructed also, including the new full semi-directional interchange between US-50 and the Capital Beltway (I-95/I-495). When the National Freeway in Western Maryland was completed in 1991, it was given the I-68 designation, and US-50 (I-495 Capital Beltway to MD-70 Roscoe Rowe Blvd.) was authorized to receive the I-595 designation, an Interstate spur from I-95 to Annapolis. In January 2001, I e-mailed and got an official word from the Maryland Department of Transportation, State Highway Administration, about the non-designation of the Interstate route on US-50 (unsigned I-595) in Maryland. According to a Traffic Engineer at the MDOT SHA Office of Traffic and Safety, he agreed with my analysis that I have had here since 1997, and he said, "we did not feel that either the posting in the field or the noting on a map would serve any useful purpose for the traveling public". MDOT SHA decided not to post the Interstate designation when the project was completed in 1995. US-50 is built to full freeway standards from New York Avenue in D.C. to Queenstown, Maryland, about 52 miles east, and MDOT SHA thought that another overlapping route marker would have been confusing, and that neither US-50 nor US-301 were suitable for de-designation. US-50 or "Route 50" as most people call it, is very visible as the freeway from D.C. to the Maryland Eastern Shore. I like Interstate designations, but I think that here, it would be redundant. I've got scanned official maps from 1990 that show I-595. They are from the Washington Bypass Study Informational Handout public hearing brochure, May-June 1990, published jointly by Virginia Department of Transportation (VDOT) and Maryland Department of Transportation State Highway Administration (MDOT SHA). They are on my article Washington Bypass Studies. Above, US-50/US-301 westbound, one mile from US-301/MD-3 interchange. Notice the pavement transition from asphalt to concrete about 1/2 mile ahead. From there to Annapolis has asphalt pavement, and from there to I-95/I-495 has concrete pavement and shoulders. Photo taken by Scott Kozel on July 5, 1999. Again, the Interstate project ran from I-95/I-495 Capital Beltway, east to MD-70 Roscoe Rowe Blvd., a distance of 21 miles. The projects cost about $400 million total. This is the only section of US-50 in Maryland that was reconstructed with Interstate federal funds. My information comes from MDOT SHA I-68 design public hearing brochures published in the early 1980's, and the 1988 Consolidated Transportation Program book; I reviewed them to prepare this article. When MDOT SHA rebuilt US-50/I-595, in addition to the new 3rd lane each way throughout, they built a 4th full-depth 12-foot-wide traffic lane each way from just west of US-301 to I-495/I-95, as a future traffic lane, but initially to be utilized as a shoulder. Projects completed in 2002 converted that lane to a High Occupancy Vehicle (HOV) lane, and MDOT SHA built a 4-foot shoulder adjacent to that inner lane each way. Actually, the median is wide enough, that there is space for a full 10-foot-wide inner shoulder each way. This section of US-50 with the HOV lanes is 8 miles long. Commuters headed to the Washington D.C. region today got another option to save time, save money and reduce stress on their trek to work with the opening of the new High Occupancy Vehicle Lane (HOV) along eight miles of US 50 between US 301 and I-495 (Capital Beltway). The new 24-hour HOV lanes are HOV-2, meaning carpools of two or more people, buses and motorcyclists can use the lane. The Maryland Department of Transportation's State Highway Administration started the $22 million construction project summer 2001 and converted a shoulder area to a lane. The 24-hour designation is for safety to be consistent and reduce confusion for motorists so that it is clearly an HOV lane, not a shoulder. SHA recently started a $4.3 million construction project to install sound barriers to protect the Ardmore and Princeton Square communities. Interstate 595 - Maryland by AARoads.com. I-595 (not signed as interstate) Maryland, by Kurumi's 3-digit Interstate Highways. Copyright © 1997-2004 by Scott Kozel. All rights reserved. Reproduction, reuse, or distribution without permission is prohibited.